There are so many wonderful cookbooks out there that specialize in certain types of food. And, it's always nice to add one to your cookbook collection. 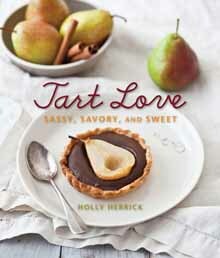 One that you may want to consider is Tart Love: Sassy, Savory and Sweet by Holly Herrick and published by Gibbs Smith. First of all, it's an absolutely gorgeous cookbook. The photographs are by Helene Dujardin who is an inspiration to all of us food bloggers out there. She writes the blog, Tartlette, and is the author of one of my favorite food photography books, Plate to Pixel. I was just happy to flip through this book and look at the photographs. Photography aside, Holly Herrick's recipes look and sound absolutely delicious. In the beginning of the book, the author starts out sharing two pastry recipes - master savory pastry and master sweet pastry that will be used throughout the entire book. Everything you need to know to perfect your tart crust is in this cookbook. The remainder of the book is divided into these chapters: Savory Tarts and Tartlets, Savory Pies and Pot Pies, Savory Quiches, Savory Meat and Veggie Pockets, Sweet Custard and Cream Tarts and Tartlets, and Sweet Fruit Tarts and Pockets. Within each chapter, the recipes are divided by season - the perfect tart for the perfect season. 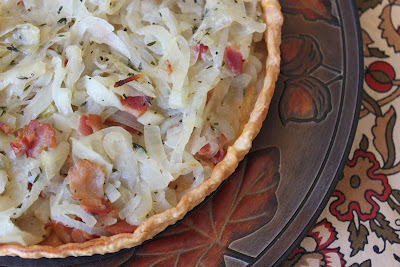 Since we're in the spring/summer mode now, I made the Vidalia Onion Tart with Bacon, Honey and Fresh Thyme. It was my first tart ever and I enjoyed the process. Was it perfect? No, but that's to be expected. If I had to do it all over again, I would have browned the onions a little more but you live and learn. And, next time, I'll do better. I promise. I have to try again because there's a Lowcountry Boil Puff Tart with my name on it. And, there are some sweet tarts that I have to attempt: Strawberry 'n' Cream Dream Tart and Butterscotch and Caramel Apple Tarts. I have to make them because, after reading this cookbook, I ordered the rectangular-shaped tart pans that Herrick suggested. I've made an investment in my tart-making future. And, I'm looking forward to more tart-making experiments. Do you think that you would like to experiment with tart-making? Well, if you're interested, I do have an extra copy of Tart Love that I'm giving away to one of my followers. Just leave a comment below telling me that you're interested in the cookbook. Also, leave an e-mail address where I can reach you if you're the winner. Disclaimer: The publisher provided me with a copy of this cookbook, but the opinion expressed here is my own. I'm interested! I love to cook and am always looking for something new to change up the menu! Thanks! I would love this book. I am currently on a tart mission, making regular sized and mini tarts of all kinds. This book would be great! I just purchased a tart pan last week when I was out thrifting, perfect timing. I had just thought that I've never made one and I had been reading recipes trying to find one that I could make. Thanks so much for such a great giveaway! I am interested in the cookbook. thanks for the chance. I would love to have this cookbook. Thanks for chance to win. Wow, those recipes sound terrific! I would love to add this cookbook to my collection. I would love to try a tart. I have not this before. I would love to win this cookbook. I actually just recently tried my own hand at making tarts. I did a mushroom and thyme tart. It was amazing. Thanks for the chance to win! I'd love to win this cookbook! I've had a tart pan for some time now and have needed the motivation to use it - this book qualifies big time :-) Thanks so much for providing this opportunity...love your blog! I love to bake. It's a religious experience. My Grandmother, Auntie Anne, Cousin Louise & a former Deaconess "Aunt Ella" where my late husband was Pastor were the creators/nurturer to my love of baking. Please share your joy of baking, designing, & creating with me. I have a Pampered Chef Tart Pan sitting lonely in the cabinet, just waiting to be filled with yumminess. Thank you for this wonderful opportunity to win this cookbook. I buy Gooseberry Patch cookbooks as gifts but would love to have one for myself! I would love this cookbook. I really want to win this cookbook & try ALL the recipes. It would be great to invite my friends for a brunch of various tartes . Yummy !!! I really want to win this cookbook. With all the awesome recipes, i know i can come up with a brunch menu for my friends & family. I would like to win this cookbook, thanks! Always room for another cookbook and this one looks great!!!!! Thanks!